"This home-cooked barbeque sauce is especially great on pork or venison. This recipe makes plenty so you'll always have some when you need it. Use this to baste meats only during the last 15 minutes of cooking. Overcooking will give the herbs and spices a bitter taste." Heat the bacon drippings in a saucepan over medium heat. Cook the onion in the bacon drippings until soft, about 7 minutes. Stir in the garlic and ginger. Cook and stir another 30 seconds. Reduce heat to low. 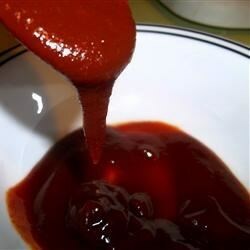 Stir together the ketchup, Worcestershire sauce, soy sauce, brown sugar, balsamic vinegar, lemon juice, chipotle sauce, mustard, ground chile pepper, pepper, salt, cumin, coriander, and paprika in a bowl. Stir sauce into the onion mixture, and simmer for 20 minutes, stirring frequently. Dip into this spicy-salty-sweet awesome sauce! Tangy, peppery and a sweet. Tried it with a can of crushed tomato instead of ketchup as well, and it was still awesome, more smoky and less sweet tasting though.